Tonight is a frigid night here in Wisconsin, so I’m at home playing! As promised in my last post, I have two more samples using the 3″x 3″ squares that we cut from a 3″x 12″ piece of the Best Year Ever Designer Series Paper. Adhere the whisper white piece to the card base with Snail, or your favorite adhesive. Adhere the Best Ever DSP 3″ x 3″ piece to the Soft Suede piece, then adhere the square to the whisper white cardstock. That’s it – easy and cheery! The colors in the Best Year Ever paper are Calypso Coral, Coastal Cabana, Crushed Curry, Sahara Sand, Soft Suede, and Whisper White. So you have lots of choices for color combinations! 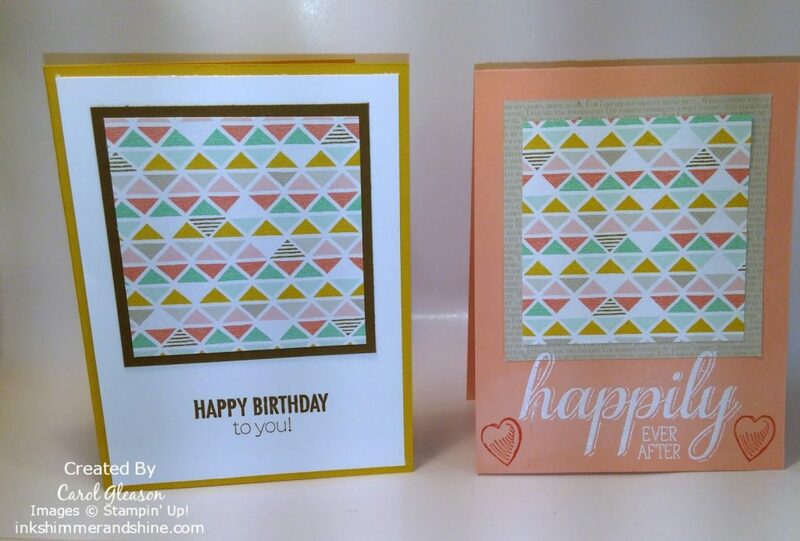 Cut a 3-1/2″ x 3-1/2″ piece of Sahara Sand paper from the retired Neutrals Pack, but you could substitute a plain piece of Sahara Sand cardstock, or one subtly stamped with a background so that it doesn’t compete with the DSP pattern. 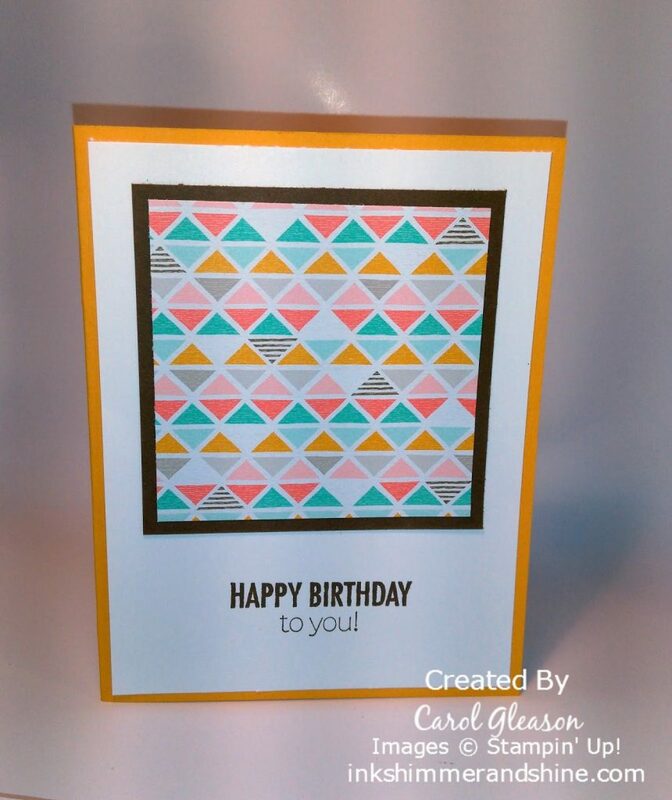 Adhere the Best Year Ever DSP 3″ x 3″ piece to the Sahara Sand square, then adhere the square to the Crisp Cantaloupe cardstock. 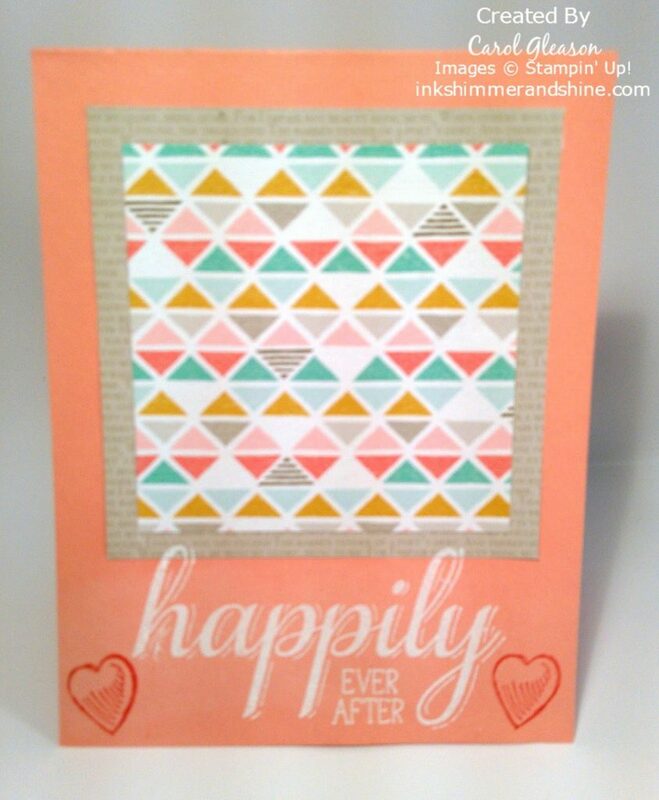 Stamp the Happily Ever After sentiment from the Big News stamp set in Versamark ink and emboss it with White embossing powder. Stamp the hearts from the Big News stamp set in Calypso Coral ink, and you have a pretty card for the happy couple. See how versatile this paper is! We’ve made a baby card, a birthday card and a wedding card so far. Tomorrow I’ll show some additional ideas for using your pretty DSP. Just by varying the card base color, and using the 3″ x 3″ DSP alone, or backed with a dark color and 1/8″ border all the way around, or backed with a lighter color 1/4″ border, you can change the personality of your card. Don’t forget that you get one free product from the Sale-a-Bration flyer for every $50 you spend (before tax and shipping). This pretty paper is one of your options, but there are lots more options for free product. Best Year Ever, Big News, embossing, Playful Pennants. Bookmark.